Enviromate Donate are proud to be supporting this fantastic Rebuilt4u Community Project in Jaywick, Essex helping re-home individuals who have found themselves in unfortunate circumstances and living on the street’s. The project begins with the regeneration of a property from reclaimed and surplus materials and the guys need your help in all forms from materials to volunteering support – take a read of the project overview below and if there is anyway you can help however small then drop us a line at hello@enviromate.co.uk to discuss; Rebuilt4U is a registered not for profit community interest company set up with the aim to regenerate the derelict housing stock in some of the UK’s most deprived areas. We want to provide affordable housing for all. We will target our support where we know it will have the most lasting impact. Rebuilt4U was founded by Daniel Hill. A successful entrepreneur who is a regular on TV and featured in shows such as Channel 4’s Ultimate Dealers and SuperScrimpers, BBC’s 24 Hours in the Past and most recently the hit Dave show Storage Hunters UK. This wheeler dealer will turn his hand to anything but his passion is to help others achieve. Having a roof over our head is often taken for granted but there are many families and individuals who do not have a place to call home. 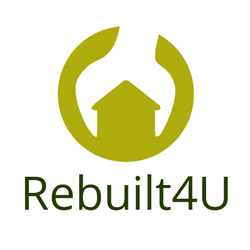 Rebuilt4U want to help provide homes for those in need by renovating and building more affordable housing. With your help we can make a difference. We are looking for volunteers who can donate a few hours of their time or expertise to help make dilapidated properties liveable again. If your a builder, carpenter, electrician, labourer or you can donate building materials or essentials like bathrooms and kitchens then we would LOVE to hear from you. YOU CAN MAKE A DIFFERENCE.